No one really knows when it was that humans discovered the connection between romance and music. However, centuries later, the songs and tunes relating to the correlation between the two are countless. Ambient-Mixer.com took a deep look at the connection between romance and music and what has helped to make it the perfect combination. Beethoven is considered one of the greatest composers of all time by many. It was after Beethoven that other composers began to focus and express in their music the intense feelings in their tunes and compositions. Soon after this romantic renaissance came about, others used music and romance and consolidated it together with opera as a way to visualize for their audience the message and connection between the two. As the concept of romanticism grew stronger, artists, poets, painters and many others also began to use music as the background to stage their work. As the years went on and technology gave us movies with sounds, a whole new era exploded which focused on romance on the screen with music used to drive forth the message of love in countless movies. It is hard to imagine watching a romantic movie (or any other for that matter) without music in the background to assist in selling the story-line. It wasn’t long before many musicals were made for both the big screen and Broadway shows where romanticism was the backdrop within the plots. Latinos or Hispanics have been using music as a way to send their message to their love interest for decades. Many movies depicting a Mexican “Mariachi’ singing romantic songs as they serenaded someone by a window became very popular in the early 1930’s. A ‘Mariachi’ consisted of a group of musicians who would accompany the person who was in love with someone. As the Mariachi played on, the person accompanying them would often sing a song expressing his or her love. In most cases the person being serenaded would open a window and listen as he or she was entertained by the sounds of a love song, the Mariachi and the love interest. So history has taught us that music and romance know no bounds, limits or barriers when love is the message. It has also taught us that those in love use music as way to express their romantic feelings for another person. Restaurants catering to couples in love often have live bands which play music softly in the background as the twosome dine in romantic lighting and atmosphere. No one really knows who first made the connection between romance and music. 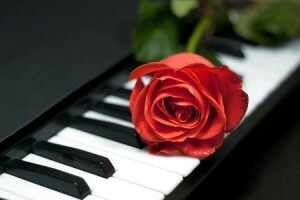 However, we do know that these days it is very hard to express love or romance without using music. With romantic tunes as the background theme to demonstrate the importance of the message of love, millions continue to make use of the connection between romance and music.